With all of NASA’s budget cuts, it’s easy to lose sight of the big picture when it comes to space exploration. Right now, we hear nothing but bad news. But we have to remember the International Space Station is still up in the sky, astronomers are still finding lots of new planets, and private companies are very close to taking over where NASA left off. At a conference for the advancement of science, Canadian Astronaut Chris Hadfield said humanity will look back on the 21st Century as a series of baby steps into space. Yes, we’ll fall down a lot and get a few bruises, but we’re still learning, and we have to take those baby steps before we can go a lot further. 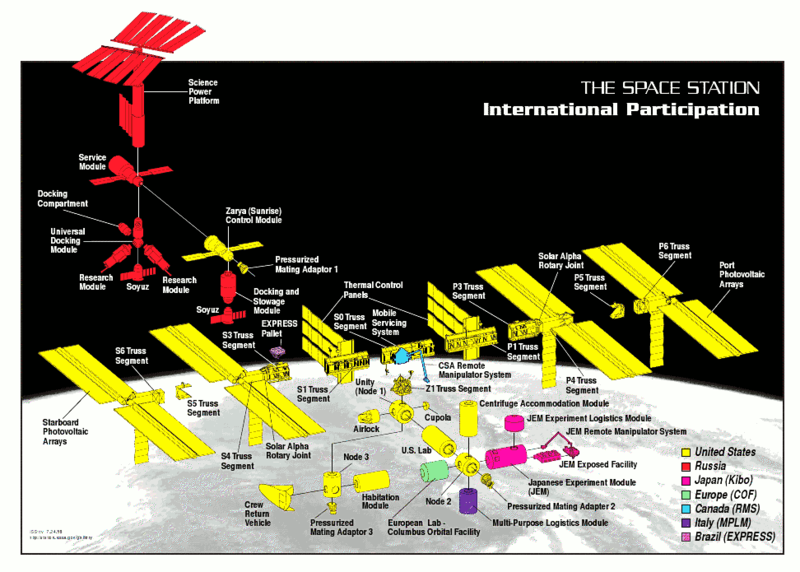 Diagram showing which countries contributed which parts to the International Space Station. Click picture to enlarge. Hadfield is scheduled to go to the International Space Station in December. During his time aboard the ISS, he says he will be trying to solve basic problems about human space travel, like blood chemistry, nutrition, and waste. Astronauts aboard the ISS are working on approximately 100 different experiments to make it safer and easier for humans in the future to travel beyond Earth orbit. For about two months, Hadfield will be in command of the space station. He will be the first Canadian to have that honor. For the original article on Chris Hadfield’s statements, click here. Posted by J.S. Pailly on February 20, 2012 in Uncategorized and tagged canadian astronaut, chris hadfield, international space station.